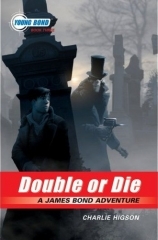 Double or Die has finally arrived in the United States (officially this time) after forcing American fans to wait over a year since its release in the UK. The U.S. edition unlike its UK counterpart comes in hardcover form and offers a far better and pleasing cover design by Kev Walker. I never did review it, and perhaps someday I will, but it definitely falls in as my second favorite of the series following Blood Fever. Check out the Young Bond Dossier’s review.